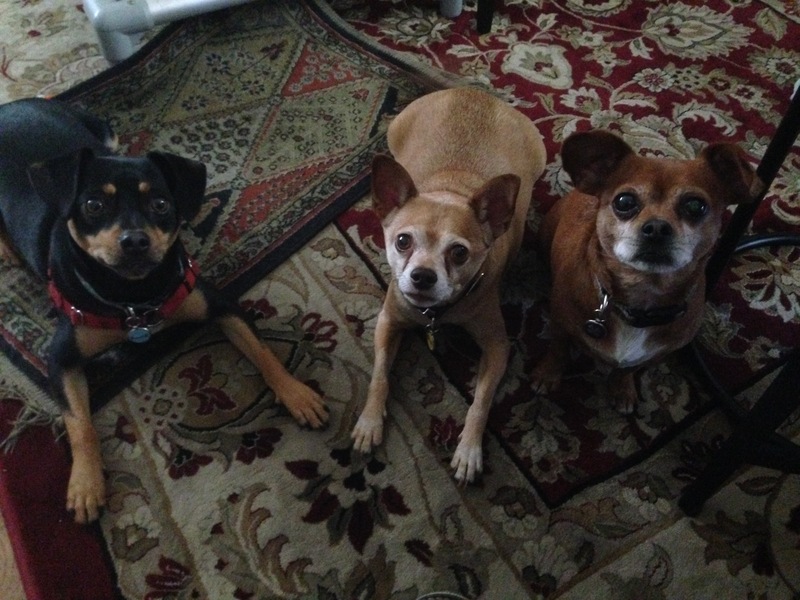 I was able to stay in Santa Monica for my session with Rocket, Rudy and Roxie. I was primarily called in to work with Rocket who is a two-year-old Min Pin Mix that screams / barks at kids, skateboarders and sometimes people when out on walks. In addition to the two other dogs featured in the photo, Rocket lives with three other dogs which makes for an interesting home environment. When you have one dog, rules, boundaries or structure aren’t always needed to get the dog to behave. But when you have a pack of dogs, rules and structure become much more important. Dogs are social creatures and when they live together, rivalries can develop pretty easily. While this is usually amongst the dogs themselves, it can spill over to the humans as well if they don’t correct the dogs when engaging in unwanted actions or behaviors. When a dog is engaging in an action or behavior in the presence of a human, and the human does not disagree or correct the dog, the pooch interprets this as agreeing with the dog’s actions. It didn’t take long to see that these dogs desperately needed someone to add rules and structure into their day to day lives. While their guardian is a wonderful person who is a passionate dog lover, sometimes how and when you provide love and affection can speak louder than what you say to the dogs. In this case, the dogs were jumping up or climbing up on the humans in the house whenever they wanted attention. When a dog climbs up on top of a human without permission, its a classic sign that the dog does not respect the human’s authority. Just like humans, there are lines and limits dogs don’t cross when they are with someone who holds a higher level or rank or authority. The other reason the dogs engaged in this behavior? Jealousy. 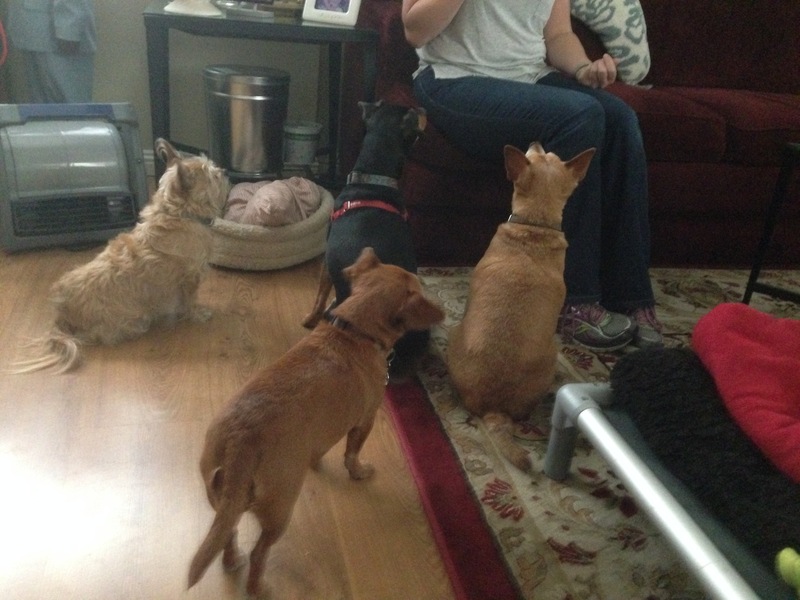 Whenever one dog saw another getting attention, it would run on over to get some of the same. Stopping this behavior is easy, but requires discipline on the human’s part. Step one is to stop petting the dogs when they climbed up on, nudged or pawed at the human for attention. Once the dogs realize that the technique no longer works, they will stop and look for another way to get the human’s attention. I like to teach the dogs to ask for attention or affection by walking over and sitting politely in front of the human a few feet in front of them. But before we could work on that, I needed to show their guardian how to define her personal space. Dogs have three distance markers; intimate space (a three foot bubble around the human), social space (three feet to 11 feet from the person) and public space which is anything beyond 11 feet. Dogs will act and react differently to people and animals that come into these space zones. To teach the dogs to respect their guardian’s intimate space, I had the humans stand up any time a dog moved inside the three foot bubble surrounding them. To a dog, standing up with your hips and shoulders facing the dog is the most commanding and authoritative posture a human can adopt. As soon as the human stood up, the dog that was nearest stopped and or stopped and moved back a bit. Their guardian had to stand up a half dozen times or so before the dogs started to take notice. The more she did so, the less the dogs invaded her intimate space. Timing is a crucial aspect of this technique. If the dog comes over and gets within the three foot bubble and you don’t respond within the first minute, the dogs will take much longer to get the message. But by standing up as soon as the dog passed the three foot marker, their guardian was able to quickly communicate that she wanted some personal space respected. To help condition the dogs to sit in front of the humans to ask for attention, I went over a basic recall exercise with them. While they didn’t over treat their dogs, their guardian usually pulled out a treat for multiple dogs and they all got them. So even though dog A responded right away when called and dog C came over a minute later, they both got rewarded with the same treat. This is essentially giving both dogs the same grade when their “work” was very different. To motivate the dogs to respond quicker, I simply reduced the reward to a single treat. We took turns calling the dogs with a “come” command and then presented that treat to the first dog to come over and sit down in front of whomever called them. At first, Rocket was the dog getting all the treats, but once the other dogs discovered there was no prize for second place, they all started to snap their heads around and start moving as soon as they heard the “come” command. Within 10 minutes, all the dogs were running over and sitting politely in front of anyone who called them. Because we had already communicated that they needed to respect the three foot bubble of intimate space around the human, the dogs started automatically sitting down in front of their guardian when she gave the recall command. By the end of the session, the dogs were calmer, responding better and even restraining themselves to respect the new rules and boundaries we introduced. It will take practice and consistent corrections with good timing inside their home before these new behaviors become second nature. Once that is the case, the dogs and guardians will be better equipped to deal with more advanced issues like Rocket’s reaction to dogs, skateboards, etc.